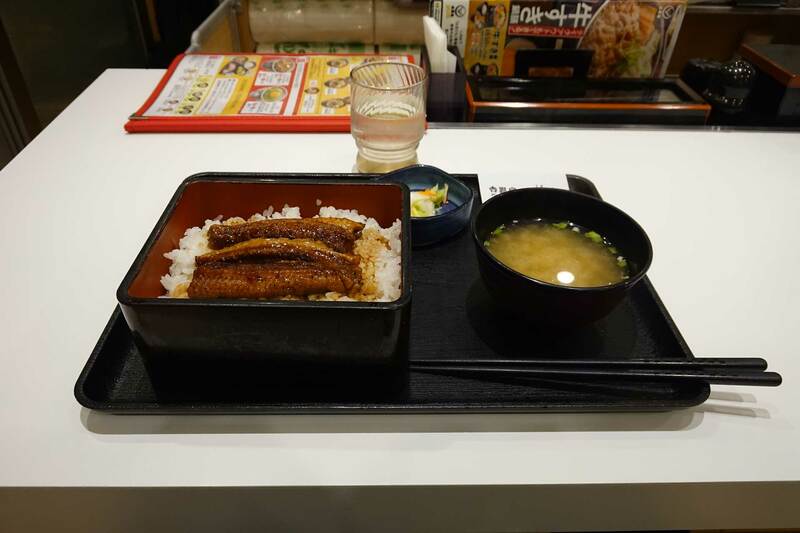 The first food I had wanted to have in Japan, knowing that sansho (Japanese pepper) would play a role in that, was unagi – eel. I had known (of) a good place for that, too, went into that area – and then it was closed and had some explanation on the door that was way more complicated than my meager Japanese was able to manage. Waiting at Haneda Airport overnight (as I didn’t want to pay for yet another night at a hotel when I would have had to get out of that before public transport even started running), I not only found the best store for the various specialty Japanese KitKat, but also two places for unagi. One of these places would have been an old specialty restaurant’s airport branch. That sounded interesting, but would have been rather expensive, so I decided against it. But, among various noodle bowls and rice sets, they also had unagi, so I tried that there. It was quite okay, actually – rice, fatty eel, some pickles, miso soup on the side – and of course, for the finish of my time in Japan seeking spice, the spice was there in the form of a pack of sansho. In its – in Japan – usual green form, lemony with just a bit of zing as that is, the sansho did indeed fit with the eel very well. But then, it also had been good with the chicken I had had it with, on soba or udon… and now, I hope my plants of the same will continue to grow, and it’s time to experiment with the spice I brought back.